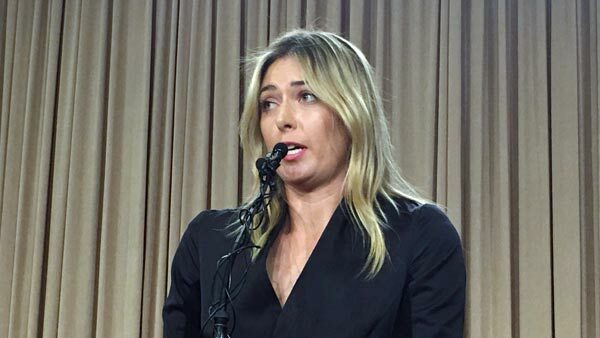 LONDON -- Maria Sharapova was suspended from tennis for two years Wednesday for testing positive for meldonium at the Australian Open, and immediately responded by saying she would appeal the decision to sport's highest court. The ruling by an independent three-person panel appointed by the International Tennis Federation said Sharapova did not intend to cheat, but that she bore "sole responsibility" and "very significant fault" for the positive test. The ban throws into doubt the on-court future of Sharapova, a 29-year-old Russian who is one of the most well-known and - thanks to a wide array of endorsements - highest-earning athletes in the world. She is a former top-ranked player who is one of 10 women in tennis history with a career Grand Slam - at least one title from each of the sport's four most important tournaments. So much came so easily for her at the start: Wimbledon champion in 2004 at age 17; No. 1 in the rankings at 18; U.S. Open champion at 19; Australian Open champion at 20. About 200 athletes tested positive for meldonium this year from various sports and countries - many, like Sharapova, were Russian - and some said the drug stayed in their systems for months even though they stopped using it in 2015.